If you play enough Super Smash Bros. on the Nintendo 3DS, you’ll eventually unlock the ability to edit more than the standard set of rules. You can tweak all sorts of battle conditions, including forcing a penalty for players’ killing themselves or adding a time limit to stock matches. The extra rules, again, are unlockable on the Nintendo 3DS. On the Wii U, as revealed by Masahiro Sakurai by way of his Miiverse account, gamers will be able to dive into the More Rules menu immediately. Alongside the image you see above, Sakurai took time to show off all of the “comical pictures” that appear as you cycle through the options. Here are those images along with his commentary. 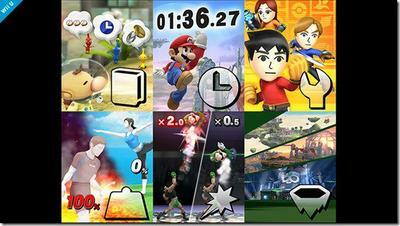 Going clockwise from the top-left corner, here are the pictures that appear for Rules, Time Limit, Custom Fighters, Stage Choice, Damage Ratio, and Handicap. 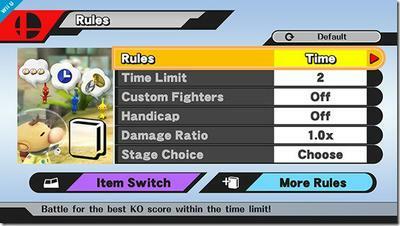 In the Wii U version, you can customize additional rules from the beginning of the game. 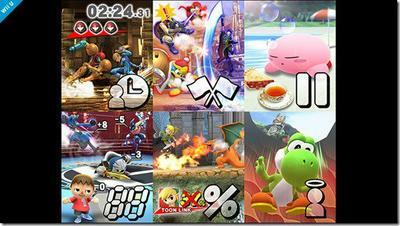 Here are the pictures displayed for Stock Time Limit, Team Attack, Pause Function, SD Penalty, Damage Display, and Score Display. You can almost hear Fox’s cry in the picture displayed for SD Penalty settings. Super Smash Bros. will hit the Wii U on Nov. 21, 2014. The Nintendo 3DS flavor is already out and selling well.